How do we know about the outer world — or reality, for that matter? Where does our knowledge about it come from? The attempt to answer these questions leads to epistemology, the branch of philosophy dealing with the origin, scope, and validity of human knowledge. A priori theory shows us that deviating from the sound-money principle leads to disastrous economic, social, and political damage. From the context of natural rights, government has no justification in forcing you to pay for a charity you would not fund voluntarily. Ancient Greece’s Legacy for Liberty: Economic Ideas in Aristophanes. "Aristophanes’ plays frequently explore interesting economic ideas. Since he’s writing comedies. it’s often difficult to tell which ideas he’s endorsing and which ideas he’s satirizing (or even whether those two possibilities are mutually exclusive). For example, his endorsement of free trade in the Acharnians certainly appears sincere;1 yet his Birds offers a sympathetic portrayal of a trade embargo (albeit a rather fanciful one: the birds of the sky interfering in commerce between human beings and the gods). All the same, the economic proposals he discusses are worth our attention regardless of what attitude he himself may have taken to them." February Austrian Money Metric: Money Supply Growth Falls to Four-Month Low: The 'true money supply' measure is a measure of the money supply pioneered by Murray Rothbard and Joseph Salerno and is designed to provide a better measure than M2. Mises Daily Friday: To Oppose Free Trade Is To Embrace Violence: Supporting free trade is simply a matter of taking no action when another person exchanges in non-violent exchange with another person. Foreign Regimes Dumping US Debt — Will the Fed Just Monetize the Debt Instead? Foreign Regimes Dumping US Debt — Will the Fed Just Monetize the Debt Instead? : For years, the US government has been able to finance it's debt at cheap interest rates because there have always been plenty of enthusiastic buyers. The Interest Rate: The mystery. The intrigue. Most individuals concern themselves about this when they are purchasing a home loan, acquiring credit cards, or purchasing a new vehicle. However, this notion is much broader than obtaining more debt. It is much broader, yes, much deeper than imagined, as is not well understood, even by philosophers, economists and finance scholars. The natural rate of interest, or ordinary interest, is inherent in every thing we do as actors in a "free market" economy. What is the Natural Rate of Interest? There are two divergent models of analyzing the notion of natural rate of interest. The first model is derived from the Classical Economic school of thought. This model is based on the popular Economic frame work of supply and demand. Simply put: The interplay of the supply and demand of money, produces a particular interest rate. (Ceteris paribus) For example, if demand is held constant, and the central bank increases the monetary base, the interest rate would fall. Conversely, if the Central bank decided to reduce the money supply, with demand remaining constant, the interest rate would rise (Ceteris paribus) If this is analyzed from the demand side, if demand rises for the currency, and the currency bases remains the same, the interest rate rises. (Ceteris paribus). If the demand for the currency falls, and the currency base remains the same, the interest rate will fall. (Ceteris paribus) This Classical model of analyzing the interest rate views things at a macroeconomic level. This model was specifically pushed forward by Marginalist Economist, Eugen Bohm Bawerk. As per Bohm-Bawerk et al, the notion of the natural rate of interest speaks to the time preference of consumption from the individual actor in the marketplace. To Wit: The time preference of from the individual's consumption between today's goods, as compared to future goods. Notice that this definition has little to do with the bank's rate of interest, although the bank's rate is a singular actor's rate of time preference, as that actor would be the bank. This ratio, nets the prices between the two respective time periods. Of course, this activity is not a static, so the interest rate is constantly shifting, modulating and changing, as the actor's preferences change. Going back to the Financial Intermediaries, e.g Banks, Credit Unions, Financial Institutions, Insurance companies, and etc.) need to manage cash and their monetary equivalents, these institutions' role in the market economy is vital. They are responsible for allocating scarce resources, to wit, providing cash capital to entrepreneurs. Many people mistakenly assume the bank's interest rate is the same as the natural rate of interest, as this is demonstratively false. Let us suppose that the bank's interest rate is 5%, and the natural rate of interest, in the marketplace, was 8%. The bank would loan out, or invest, or place money in capital goods that would yield a 8% return. This process would continue until the bank's interest rate matched the return on those capital goods. Why does this happen? As the bank continues to invest or loan out money into those capital goods, the demand for those monies and goods rise. As the money demand rises, due to the need to invest in capital goods, the bank's price on money, the interest rate, rises. Once the bank's interest rate, and the return on investment in capital goods equals the same rate, it makes no sense for the bank to move money into those capital goods. What happens if the natural rate is below the bank's interest rate? If the bank interest rate is 5%, and the natural interest rate is 3%, the bank will not seek to loan or invest into capital goods at that lower rate. What may occur is the following: Banks may continue to hold the cash, at 5%, until the demand for long term capital projects rise above 5%. In this case, as in the prior case, the opportunity cost of the bank's money must be considered. Banks are seeking to profit from the arbitrage: In the former case, the Bank seeks to make a profit from the spread of 8%, the natural rate, and the 5%, the bank rate. As for in the latter case, the bank seeks to take a more conservative position and hold onto its cash. In both cases, on the long run, all actions will seek to meet equilibrium. Based on these two examples, the bank's interest rate will not equal the natural rate of interest. This is true since there would be no profit seeking opportunities. The bank's funds would sit idle, no cash capital would move other sorts of capital markets. This sort of analysis demonstrates that these two interest rates are not the same. An Example of the Use of Interest Rates in the "Real World"
With a business that is capital intensive, management of this capital equipment is vital for the success. When a business owner is seeking more cash capital to acquire a piece of capital equipment, he should be factoring how this equipment can benefit his operation, on the margin. He will look at how the marginal cost impacts the marginal benefit. If the firm has extra cash, or investment capital, it will seek to obtain a return on investment on that capital. So, if the owner of the firm is purchasing a piece of manufacturing equipment, and will yield a return on investment higher than the natural rate of interest, and the current "bank interest rate", the business owner will invest in that manufacturing equipment. The owner, like all humans, is engaged in a profit seeking enterprise. And, it is that profit that is his return on investment. As with all things, in the capital markets, actors are constantly pushing towards equilibrium. All actors are seeking a state of peace, or in economic terms, equilibrium. The constant ebb and flow of the play between the natural rate of interest, and the interest rate placed by financial intermediaries demonstrates this. The natural rate of interest simply is an expression of human action, as the individual's preferences span throughout the space/time continuum. National Sales Tax: Is it a good Idea? "Which is better: The National Sales tax, or the Flat Income Tax, Robert?" I am asked this question constantly. Many folks that push for a "Fair tax", or National Sales tax, are under the illusion that this sort of tax is better, as it will rid us of the IRS. I am under no such quixotic vision of the future, as the special interest groups are well vested in having a tax system. My reply, regarding the "Fair Tax" or VAT, technically they both are similar, will be stated in the words of Murray Rothbard, Phd. See the link to the article below. The Value-Added Tax Is Not the Answer: The VAT allows the government to extract many more funds from the public — to bring about higher prices, lower production, and lower incomes — and yet totally escape the blame, which can easily be loaded on business, unions, or the consumer. Negative Rates May Be Ineffective and Dangerous: ... according to the Bank for International Settlements (BIS) — the so-called central banks' central bank. The notion of a Negative Rate of interest, is risible at most. According to the pure definition of interest, the interest rate is defined as the price ratio between the following: Present goods vs Future Goods. To wit: This helps define the inter-temporal time preference of the actors in the market place. This is the definition, as per the work of Marginalist thinkers of Economics. 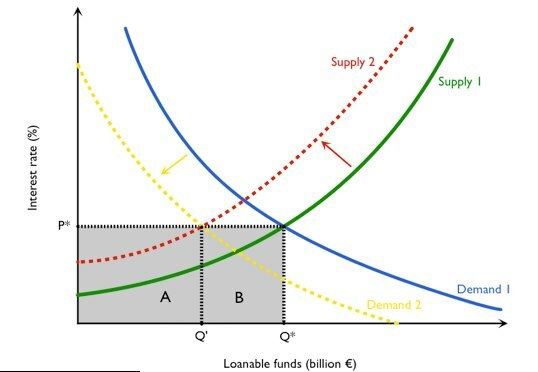 If one were to consider the Classical economic model of interest, it is defined as the equilibrium price between the supply of money(currency) in circulation, against the demand of that money. In this model, the interest rate acts as a "price". In either model, the question remains: How is it possible to have a negative interest rate? If one considers the former model, how is it possible to have a negative interest rate? Does one prefer items prior to their creation? Does one go backwards in time to prefer and obtain items? Or, if one reviews this notion of negative interest rate using the classical economic model, how does one determine a negative "price" of money? How Sweet It Is! The Maple Syrup Cartel Crumbles: Economists have long argued that irresistible market forces will crush a cartel that inefficiently restricts supply and raises the price of a product. This article is proof, that over time, cartels can be eroded. The economic notion of elasticity of demand will always rule. Customers will, if given alternatives, exercise those alternatives, relative to how the value those things they have during their utility seeking process. In English: People, during their pursuit of happiness, will acquire the things that provide them the best value. When value equals and exceeds price, an exchange takes place. If the value begins to drop below the price, people will seek out alternatives. Recall that value is subjective to each person.